The hoist is one of the most used lifting machine tools. Hoists are an important lifting machine used in many industrial facilities. An essential component in the operation of many hoists is the trolley. The trolley is a piece of equipment that the hoist is attached to that allows the hoist to move horizontally along an elevated beam. Thanks to the overhead trolley, the hoist is allowed to lift and lower loads by acting as the base in which the chain or cable can move up and down. There are many different types of hoists that can be used with trolleys including manual, air powered and electrically operated lifting systems. Each of these is considered to be a trolley hoist. One issue commonly associated with Hoist trolleys is the simple fact that not all trolleys are compatible with all hoists. Recently, Columbus McKinnon Corporation (CM) released a hoist trolley designed to solve this issue. Their universal trolley is designed to fit almost every Columbus McKinnon electric and air chain hoist. While the trolley itself is nothing complicated, the simple fact that owners of various different CM hoists can use a single trolley is pretty useful. In fact, companies can save both time and money when they wish to use different sizes and styles of CM hoists. The Columbus McKinnon Corporation is a leading manufacturer of material lifting products. Some equipment they have released includes hoists, rigging and cranes. Based in New York, they have been designing, manufacturing and marketing lifting machines since before the 20th century. The introduction of the universal trolley is a great addition to the variety of hoist and trolley systems currently available. In fact, this new machinery will allow their clients to use most of their hoists without the need to buy several different trolleys. 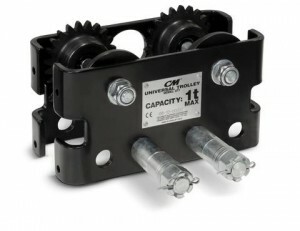 The CM universal trolley can be converted from a plain trolley to a geared trolley. The plain configuration allows for manual positioning of the hoist and load. The geared configuration allows for mechanical movement of the trolley. This is the best option for applications where more precise load positioning is required. The Universal trolley can handle most hoists with capacities up to 3 tons. It also includes an adjustable clamp designed to easily install and adjust to different styles of hoists. The clamp can be installed without the use of any tools. Next Next post: What is ISO and why is it important?